The Wreck Restaurant . . .
What they say about us . . . "Perched along the Namibian Coast, 20 meter from the shore, The Wreck secures top class cuisine in exquisite class surrounds. Unlimited views over the Atlantic; tastefully decorated interior and a intimate romantic setting make for an all round dining experience. Treat your loved one to a special night filled with top class International cuisine, romantic ambiance and breathtaking views at The Wreck Restaurant in Swakopmund." Wine Lovers ! 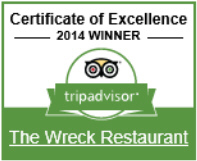 The Wreck Restaurant offers a selection of hand picked wines from South Africa's best winelands and cellars. Please browse our winelist for more detail and descriptions. For more information visit The Wreck Website.